Derrick Lofthouse has submitted his family history which he hopes will be of interest to others researching the Lofthouse family. Left to right. Elsie. Winnie. Eddie. Granny. Lil. Gladys & Marie. CHAPTER 1 “MY PATERNAL LOFTHOUSE FOREBEARS”. From a well intentioned but unfortunately not quite complete “Family Tree”, I have gleaned the following historical information which is of interest. I should first elaborate a little on our family name Lofthouse. This surname is some ways very much a misnomer as I have yet to meet anyone from our branch of the clan who justified the title of “Lofty” when applied to their stature. In fact it has generally been used as a parody of the fact. The following is an extract from “A Dictionary of British Surnames” by a P.H.Reaney. – “Lofthouse, Loftus: Peter de Lofthusum 1166 [Pipe rolls Yorkshire]: Ralph de Loftus 1219 [Assize Rolls Yorkshire}, John del Lofthouse 1365 [Reguster of |Freemen of York], John Loftus 1505 [Guild of Corpus Christi of City of York]. This common Yorkshire name may mean “dweller at the house with an upper floor” [Old Norse Lopthus] but is probably from Lofthouse [WR Yorks (3)] Loftsome [ER Yorks] of |Loftus [NR Yorks]. In about 1965 during a family outing we visited the village of Lofthouse near Rievaulx Abbey. By chance I met a retired headmistress and on telling her our name she volunteered her opinions of its derivation, or at least her opinion of the name in her village. One explanation was attributed to a row of old houses set on the summit of a hill, hence known locally as the “Lofty houses”. However the story I preferred was taken from the period of the Reformation when during the sacking of the monastery , the monks fled and were afforded refuge by the local inhabitants. Their houses or rows of cottages having attics runing undivided through the roof spaces of these terraces proved an ideal hiding place. In return for their help and hospitality the monks taught them weaving and similar crafts. Hence the name of the houses with the lofts or “lofthouses” stuck. It is interesting to note at this point [particularly for the youngest of our Grandsons] that there is included in the list of Rectors of Sedgefield of St. Edmunds Parish Church oe named Adam Lofthouse who was here from 1560 to 1562. Samuel’s family were millers and he became the first railway stationmaster at Wetherby. He married Elizabeth Bonnard. who was born about 1828 at Sutton on Derwent near York. They had 8 children two of whom were twins, Alfred & Annie. The 3 oldest , Samuel Jnr. Bonnard & Edwin were born at Wetherby. The family then took a mill at Cowerby near Thirsk, the twins & Elizabeth being born there. In July 1867 the family loaded a cart with their possessions and drove to Stockton where they had a steam powered mill. I understand that Samuel senior followed on foot! In 1871 they were living at No 4 Finkle Street, the mill being next door at No 5 where Samuel employed one man. Later in 1873 at No 4 their youngest child was born, Lucy Harriet, Isn’t it strange how these old names keep recurring? The varying fortunes of the family have been admirably recorded by Michael Corner a decendant of Elizabeth Emma. My grandfather, Edwin, who sadly died on 20th August 1916 at the early age of 54, was by all accounts a remarkable, astute and active man who was respected in the community and as a member of Wolviston Parish Church, where he served as Churchwarden. In the business world he was quite a prominent figure in local and national Grocer’s Assoc. affairs. As an illustration of these activities and working practices of those days I reproduce part of an article published in the Grocer published in April 1910. Councillor Edwin Lofthouse, who has been unanimously elected to the position of President of the Stockton on Tees Grocer’s Assoc. has had a long and interesting experience in the grocery trade. He served his apprenticeship with Mr.Clark Day an old established family grocer of Stockton on Tees. where he had to go through the mill pretty thoroughly. In an amazing letter to us Mr Lofthouse states that his life was then by no means a bed of roses. “I well remember” he writes “my first lesson when I was told to help another apprentice to push a hand cart, which in a short time I had to push along myself. After 2 years my work became much harder, when I had to wash bacon, roast coffee by hand, trounce prunes and raisins, clean currants in a bad season when fruit had been rain damaged. I remember my governor once caught me chopping currants with a chopping axe, and there was something said. We also had lump sugar to chop by hand and Scotch sugar to grind before you could wrap it in pounds, and the tea mixing day was the worst of all when the governor wanted the number of chest which were scrived on etc”. And so on, what is also interesting is a little snippet at the end which states “I strongly support, compulsory Sunday closing and shorter hours”. I hadn’t read this report until I was researching old papers for my memoirs and was fascinated to see how history had repeated itself, as you will note in a subsequent chapter. He married Hannah Davey. in 1888, hence my Father’s second Christian name. Here we go again with the old names cropping up once more. Hannah Kate Lofthouse-Hill. 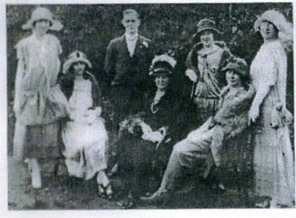 They also had a large family, 6 in all, 5 girls and my Father Edwin Davey the only son being the second youngest. I was told that when he arrived on 14th April 1900 there was much celebration in the village and some wag had run the length of Wolviston High Street proclaiming “Teddy Lofthouse has got himself a son at last”. 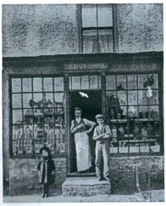 The first Lofthouse shop C 1896. Outside is Winnie aged about 4. It appears that Grandfather Edwin started his grocery business first in Stockton on Tees in 1886 where Winnie their 1st daughter was born on 26th June 1892. They then moved to Wolviston and opened the shop there some 7 years later. Gladys the 2nd daughter was born just after the move to the new house and business. Her birthday was 4th June 1893. Granny Lofthouse must have had her hands full at that time, moving into a new house in a new area, with 2 young daughters less than a year between them. In addition Grandfather Lofthouse would be very involved and busy getting the new business of the ground. They must have coped very well in the circumstances or liked baby girls a lot because Lillian followed on 26th July 1896 to be followed in just over a year later by Marie on 18th August 1897. I have already mentioned my Father, edwin’s arrival to be followed lastly by Elsie on 8th July 1906. On the untimely death of my Grandfather in 1916 the business was taken over by Granny Lofthouse. She would be helped in this by Winnie & Lillian who turned out to be the business ladies of the famly. Later of course my Father Edwin became more involved, but army service interrupted this. Gladys assumed the role of Mother Hen looking after them all. Marie being the only academically blessed, became a teacher and in fact was the only one to marry, except of course my Father. Which leaves Elsie, who was not always robust but managed to help Gladys with the housework and in addition looked after the sweet department and had piano pupils. My memories of Granny Lofthouse are sadly few though none less affectionate. I do remember playing peek-a-boo across the heavily laden dining room table on the occasions of family get togethers at Wolviston in the early days. But to me, then, she seemed alrady a very old lady [though by todays standards at just turned 70 hardly so]. My later memories of her, were being wheeled in a large invalid chair after suffering what must have been a severe stroke, with the family dog, a spaniel called Bell, on the front foot rest, Granny well wrapped up in a large rug. Although Winnie, Gladys & Elsie never married I understand romances did come and go. Unfortunately as was typical of that time, The Great War and the untimely death of so many eligible men was responsible for many broken hearts. I think Lilian [Aunt Lil] my godmother was engaged to a Sergeant in the army who was killed in action. Elsie also was engaged for a time much later but this came to nought. Aunty Marie kept a very interesting diary which came to light after her death. Cousin Maureen has quoted parts to me and it seems to typify life in a middle class home of that period. Uncle Jimmy [Black] her husband worked for Brumen-Mond the chemical company in Billingham which subsequently became ICI. They lived in Seaton Carew for many years in Seaton Lane, prior to moving to Uddingston in Scotland during the war where Uncle Jimmy was works manager. He was subsequently honoured with the OBE for his work in connection with staff and union relations. They later moved to a splendid house in Bothwell. “Dalmarnoch House” and lived there in happy retirement until their deaths. Their children were Maureen born 7th June 1925, James born 1926 who died in infancy a year later attributed to a smallpox vaccination. & Barrie born 27th January 1929.
in the old Stockton secondary school in Nelson terrace, now demolished. As I later successfully passed what was then known as the scholarship examination in 1939, and also attended there. I was amazed to learn that a number of the masters were the same as had been teaching in my Father’s time. Probably because many of the younger masters had been called up. On leaving school he went into the business and he did tell me one funny experience he had as a boy helping his Father. At the rear of the shop was a cellar down in which were kept a variety of things for sale. In those days, as in my time, lot of commodities were bought as bulk items and then hand packed as required. One of these was treacle, stored in barrels. After filling a jar for a customer, apparently father left the tap open with the result that the entire contents flowed all over the cellar floor. Apparently his father was understandably far from pleased and made him clean up the sticky mess, which must have taken a very long time. Following service in the Voluntary Reserve from 19th June 1917 he enlisted in the Durham Light Infantry on 18th July 1918 and served in the army until being demobolised on 7th February 1920. He was of course fortunate not to have been that bit older as the Great War, as it was known then, was growing to a close when he enlisted and he thereby missed the horrors of the Western Front. He served most of the time in the Army of Occupation in Cologne. A story of that time, I remember, being how he was pressed into the Regimental Band for the big parade. He was given a kettledrum, shown how to go through the motions of playing, but warned on pain of death not to hit the drum – he was only there to make the numbers up. After demobolisaton he went back into the business with his Mother and sisters at Wolviston. One of my memories of the old Wolviston living room was a rather neat hole in the ceiling which was caused by him showing off his rifle drill to the family and sticking the bayonet into it – the ceiling being very low by todays standards. His passion, before and after meeting my Mother, was motor cycling. he was I understand quite reckless and others warned that he would break his neck one day. he did break his wrist, though this was by foolishly putting his thumb the wrong way round the starting handle of an old Model T Ford van when it backfired. He never had the wrist properly set which resulted in a deformity later. nevertheless he must have been an accomplished motorcyclist as he was retained to ride for the Ariel Motorcyle company. One of his dubious achievements being to be the first the reach 70mph on Saltburn sands. The area of the Wolviston business extended around the village to Newton Bewley, Cowpen Bewley, the beginnings of Billingham, to Wynyard estate [home of the Londonderry family], Carlton & Stillington. It was near the latter that he met my Mother in about 1925 when her family farmed at Witton Three Gates. They were married at Seaton Carew parish church in October 1926. About that time he had what must surely be one of the first mobile shops. This constituted a motorbike with sidecar adapted and fitted out to display a range of groceries etc. with space to take orders for weekily delivery. Mother & Father lived first after they were married in Prospect House in Wolviston. Later Dad decided to launch out on his own, presumably because the business would be unable to support 2 families. He borrowed £100 and opened his own shop at Morrison Street in Stillington, and it is there that I was born on 8th July 1928.